Transparency Market Research (TMR) observes that the competitive landscape in the global polyethylene terephthalate (PET) market is fairly fragmented. The research analysts expect that the competition is set to intensify in the coming years due to affordable switching costs and strong presence of PET resin suppliers. The leading five players, Indorama Ventures, M & G Chemicals, Jiangsu Sanfanxiang, Octal, and DAK Americas, collectively held a share of about 39% in the global market in 2015. Companies are focused on expanding businesses in developing economies as they countries hold terrific promise of growth. 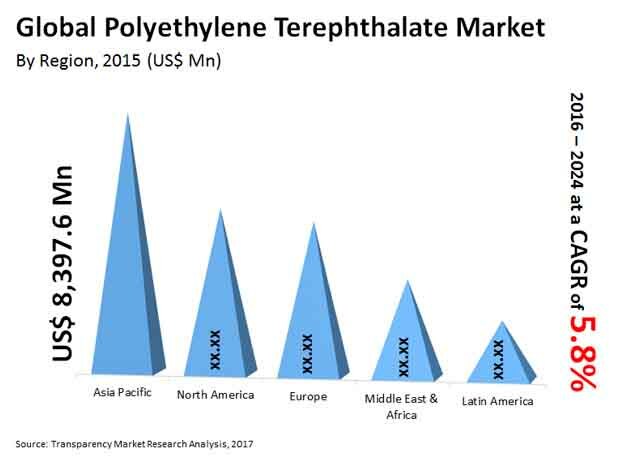 According to the research report, the global polyethylene terephthalate market is estimated to be worth US$39.16 bn by the end of 2024 from US$23.73 bn in 2015. During the forecast period of 2016 and 2024, the global PET market is estimated to progress at a CAGR of 5.80%. In terms of application, the global PET market is segmented into films, beverages, food packaging, and others such as household products and cosmetic bottles. Analysts anticipate that the demand for PET in beverage packaging is likely to remain high the coming years, showing dominance throughout forecast period. The increasing demand for production of juice bottles, dairy products, cosmetics, and water bottles is projected to fuel the growth of this application segment in the coming years. From a geographic point of view, the global PET market is segmented into Europe, North America, Asia Pacific, Latin America, and the Middle East and Africa. Of these regional market, the Asia Pacific PET market is expected to a steady growth rate in the coming years due to a soaring demand for packaged food items. As of 2015, the Asia Pacific PET market held a share of 35% in the overall market. The booming food and beverages industry in the region is also expected to make a generous contribution to the overall revenue of the regional market. The global PET market has been picking up steam as the demand for recyclable plastic has been growing at an exponential rate. PET is gradually replacing conventional glass packaging as end users are realizing its cost-effectiveness and durability. The global market is also being favored by the soaring demand for innovative packaging materials and increasing disposable incomes. The improving purchasing power has led to increasing expenditure on soft drinks, juices, water, and dairy, which has led to a high adoption of PET in recent years. Analysts anticipate that the demand for PET is also be seen in films as it will used for the production of boil-in lids and bags. These are used for packaging of yogurt, snacks, jars, and frozen meats among others. The demand for PET will also sky rocket as the production of vegetable trays, egg trays, microwave-safe packaging, and biscuit packaging gains momentum. On the flip side, the demand for PET is face severe criticism due to the trail for carbon footprint it leaves in the wake of its production to the point of its biodegradation. The impact of PET on food and beverages has also raised concerns amongst consumers in recent years. The growth of the global market is also likely to be challenged by the stringent government norms that PET manufacturing companies have to adhere to. Lastly, the volatility of crude oil prices are also expected to impact the global market negatively in the coming years.